I’ve developed a newfound love for creamed corn. Ever since my cousin’s wife, Billie, fixed up a huge pot of creamy delicious corn at last summer’s Renelt family reunion, I get cravings for it now and then. And my whole family is all the merrier when I indulge them with my cravings. I’ll share Billie’s super easy recipe using frozen corn somewhere down the road, but since it’s grilling season and the summer sweet corn is starting to roll in, this delicious Grilled Creamed Corn is what’s on the current docket. The corn cobs are first cooked directly on the grill grates, to get that beautiful char and a bit of rich smoky flavor. 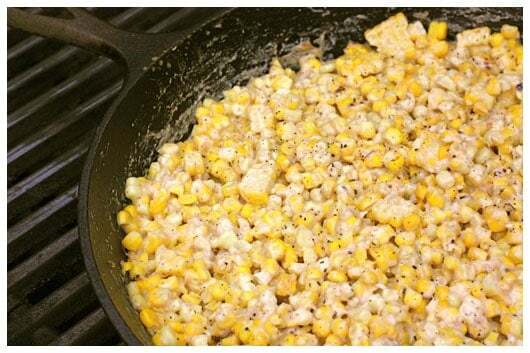 After cutting the corn from the cobs, it is then mixed to sweet creamy perfection in a hot cast-iron skillet on the grill. The skillet goes directly from grill to table, making for a fun presentation. This is a great side for any grilled meat, especially if barbeque sauce is involved. The last time we made this, I cheated a bit and grilled the cobs the day before our backyard gathering. I then cut off the kernels, put them in a bowl, and placed them in the fridge until the following day. I didn’t want to take time away from our guests to cut off the kernels, but still wanted to serve this wonderful dish. Plan B worked like a charm, and tasted just as great as when we went through the steps according to Plan A. And here’s Plan C. When we make this again, we’re going to double the quantity. I’ve found new and exciting ways to use this grilled creamed corn. Mixed with salsa, it’s a creamy, heavenly dip. Layered in quesadillas, it’s a sweet, smoky filling. And stirred into some roasted or mashed potatoes, it’s a spud reinvention. 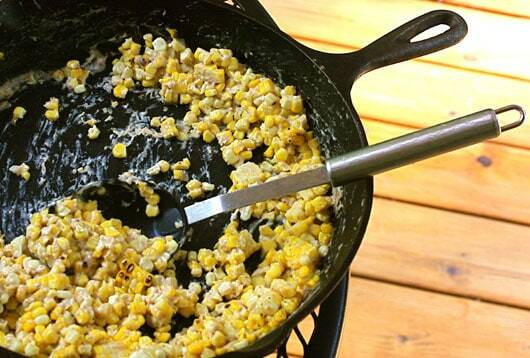 Do you have a simple and tasty way to reinvent creamed corn? Please let me know, so we can try it, too! Preheat a grill to medium-high. Arrange the corn on the grate and grill, turning occasionally, until the kernels are golden brown and softened, 8 to 10 minutes. 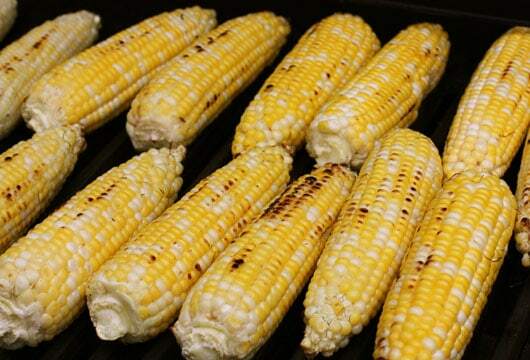 Remove corn from grill. Once cool enought to handle, remove the corn kernels from the cobs; discard the cobs. You should have about 5 cups of kernels. Lower the grill temperature to medium. It is very important to get the heat lowered, so the butter won’t burn. Heat a large cast-iron skillet over the grate. Add the butter to melt, then whisk in the flour until combined and foaming, about 1 minute. Gradually whisk in the milk and cream cheese and cook, whisking constantly, until smooth and thick, 2 to 3 minutes. Stir in sugar. 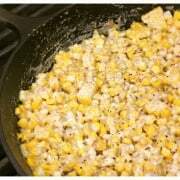 Stir in the corn kernels; season with salt, black pepper and the cayenne, if using, and cook until heated through, about 1 minute.